Anello adattatore per fotocamere Nikon ad obbiettivi Kiev 88 o Kiev 80 e Hasselblad 1000. Il Raccordo consente di montare i famosi obbiettivi per medio formato sulle reflex Nikon, oppure sfruttando la parte migliore dell'ottica. Su richiesta sono disponibile gli attacchi per reflex ( Sony; Canon fd; Pentax; Contax; Minolta af; Minolta md; Vite 42x1; Olympus OM e 4/3; ecc, ecc.). 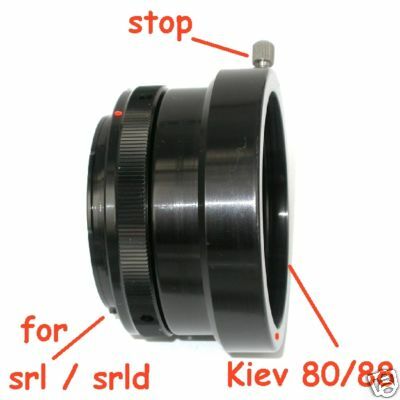 Ring of conversion for Nikon cameras, to obbiettivi 88 Kiev or Kiev 80 or Hasselblad 1000. It concurs to mount the famous obbiettivi for mean formed on reflex the Nikon, being taken advantage of the better part of the optical. Upon request the attacks for reflex are available (Sony; Canon fd; Pentax; Contax; Minolta af; Minolta md; screw M42; Olympus OM e 4/3; etc, etc).